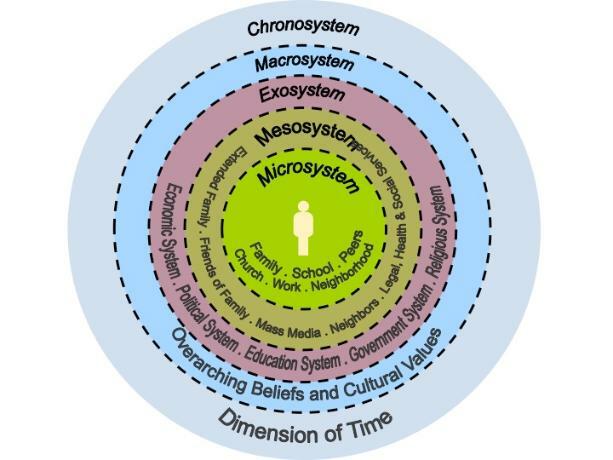 Because I am a licensed marriage and family therapist, I look at the world in a way that causes me to see the “big picture” of systems and how they interact with one another, and approach called “Systems Theory”. Although our location matters, I see past the smaller systems of Kalamazoo, Portage, Mattawan, Battle Creek, Paw Paw, and the surrounding areas of Southwest Michigan. 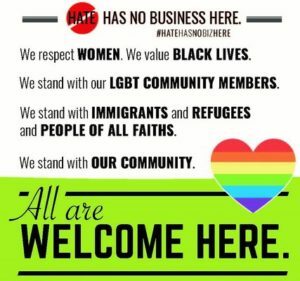 As I discuss on the “Home” page, we are not beings in isolation. 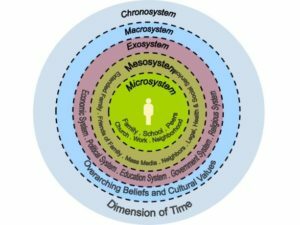 Everything we do and everything we are is connected to our unique set of systems, whether that’s our family, school, neighborhood, ethnicity, religion, or the like. While family therapy is often focused on solving problems experienced within the family, part of how I see my role when providing family therapy is allowing each microsystem (i.e. member of the family and their systems) to function in harmony together. This “I feel ___ about ___. I need ___” structure of statements avoids blaming (and the other Four Horsemen) and, because of this, can often naturally reduce the tension about the conflict. 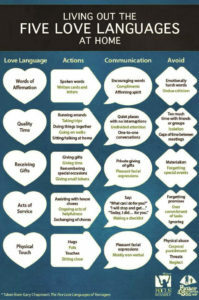 Another approach to family therapy that I frequently use and find helpful is the concept of the “5 Love Languages”. (Find a link to more information about this on my “Resources” page.) This approach to relationships, communication, and needs has been popular since the 1990s and can often be a helpful way to view why some people feel like they are putting a lot of work into a relationship without getting much back. I also use this approach frequently in couples counseling. The central concept here is that, although you may say to a loved one a million times a day “I love you”, “You are so smart”, “You look extra handsome today”, this may not be truly heard by the other if they speak a different “language” of love. 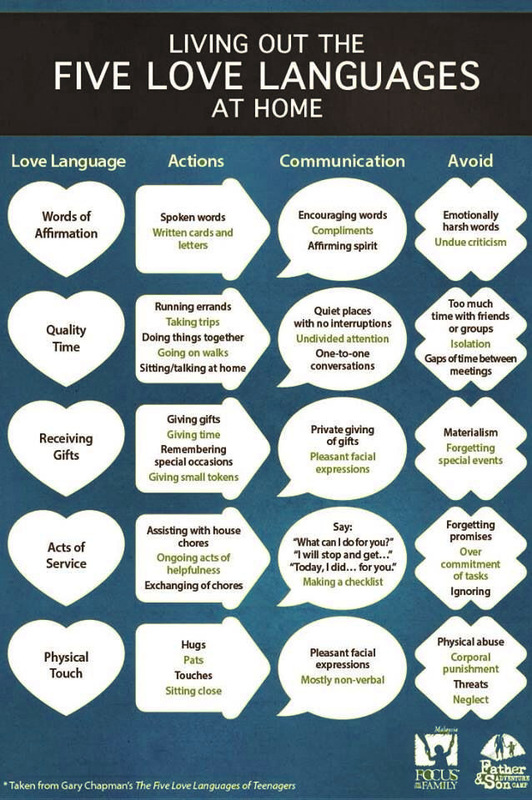 Gary Chapman first outlined in his book, “The Five Love Languages: How to Express Heartfelt Commitment to your Mate” (although they later published the “5 Love Languages” for kids and families), that people speak 5 different languages of love – Words of Affirmation, Quality Time, Gifts, Acts of Service, and Physical Touch (that isn’t necessarily sexual). Problems arise when, for example, someone is speaking the language of Gifts when the other person understands love via the language of Acts of Service. Think about it. If someone who speaks French says “I love you” to their loved one but their loved one only speaks German, this important information isn’t truly heard. And, therefore, the person whose language is German doesn’t truly feel loved. When doing family therapy, another approach I borrow from the 5 Love Languages concept is the idea of “love tanks”. I encourage clients to think of themselves and their loved ones as having an emotional bank account. When there are positive interactions (we can remind ourselves at this point of the 5:1 positive to negative ratio of interactions that I discuss on my page about Couples Counseling), love is being deposited. When the love bank account is full, even with difficult interactions, there is still the ability to withdrawal and not have an overdraft. But, when people’s love languages aren’t understood or respected, when communication about emotions or needs are non-existent, there is nothing to give from the account. They are burned out. So, conflict arises. This makes positive interactions that fill the love tank of others essential for a healthy, working organism. 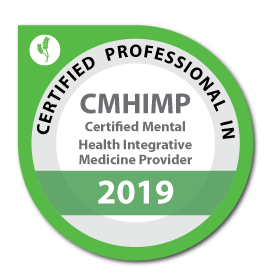 Aside from challenges with connection and communication, the other major motivator for people to seek family therapy is a transition through the stages of life cycles. This is, of course, not just limited to family therapy. Often such changes cause individuals to seek counseling for support during these times, as well. These stages are as follows: Single Adulthood, Marriage/Partnership, Parenting Young Children, Parenting Adolescents, Launching Children, Empty Nesting/Aging. These stages are often challenging changes in themselves, particularly the stage of parenting adolescents. But, it can be additional transitions within these stages, like divorce, death, immigration, addiction, or cultural issues, that cause even more stress. Whatever the issue, family therapy can be a great way to holistically address a variety of issues related to a central problem. And, even if other members of the family don’t want to/can’t be present, we can still do family therapy by addressing all of the different dynamics present in your unique situation.